Verizon’s Black Friday ad has been posted online, giving potential device buyers the inside scoop as to which phones they may want to pick up in time for the holidays. Interestingly enough, the deals don’t seem to be all that great, but they are definitely better than your everyday prices, so let’s check them out and see what might be the best bang for your hard-earned buck. These following devices will be on sale during Black Friday, all needing a two year contract to score the deals. 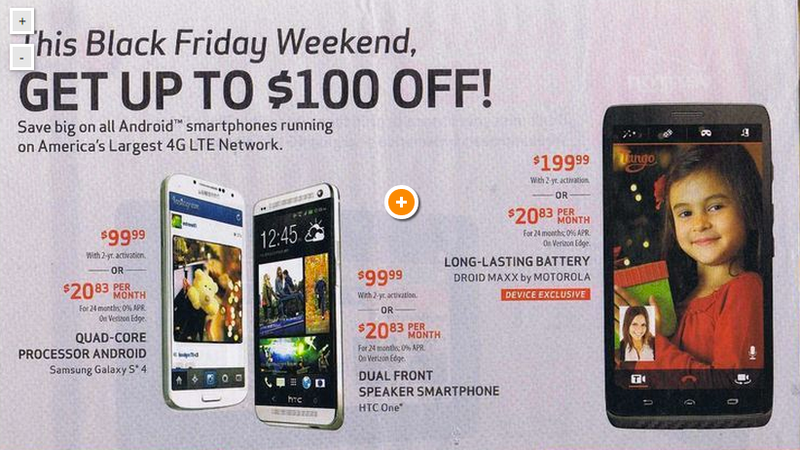 The DROID MAXX is listed for $199, Motorola’s DROID ULTRA for $99, the Galaxy S4 for $99, HTC’s One for $99, Verizon’s own Ellipsis 7″ tablet for free, plus you can get $150 off of any 10″ Samsung tablet. So basically, you can score one of the top OEM’s 2013 flagship devices for just $99 on contract. It seems decent, but when there are e-retailers such as Amazon that host countless deals that are even better than these, we think you might be able to do better somewhere else. Verizon is also hosting a Black Friday deal on accessories, and these seem to be priced much more competitively than its smartphones. The MOGA gaming controller can be picked for $15, a Jawbone Jambox is listed at just $99 ($50 savings), as well as Skullcandy Navigator headphones for $50. Is signing a two year deal worth saving upfront money on a device? We have previously gone over which prepaid options are best if you decide to buy an unlocked device (like the Nexus 5), but there are a few people we know that are stuck in Verizon’s cycle. Either way, when Black Friday comes, be safe out there. To see the full four page ad, hit up the via.